Since the Paris Agreement, EU has been committed to reduce annual greenhouse gas emissions by 40% by 2030 and at least 80% by 2050, compared to 1990 levels. Energy transformation is a key element in fighting climate change and requires a fast and broad transition across all sectors to a sustainable, low-emission energy system. It is clear that Europe’s energy transition and the decarbonisation of the economy are one of top priorities on EU level. In regard to these priorities, Committee of Regions (CoR) is emphasizing the role of regions and cities and is stressing the importance of active involvement of local communities and all levels of governance in ensuring successful transition. On 14-15 March 2019, more than 500 European, national, regional and local leaders from all Member States gathered for the 8th European Summit of Regions and Cities to discuss the future of Europe and the role of regions and cities. One of the messages sent from Bucharest focused on the role of regions and cities in acting on climate change. As global CO2 emissions hit an all-time high in 2018, we are witnessing an increasing protests in local communities, with demands for world leaders to uphold their commitments from Paris. Following recent “Youth for Climate” movement and “Global Strike for Future”, EU regions and cities backed their demands with call on the EU for more ambition and investment to keep global warming well below 2˚C and commit to a carbon-neutral Europe by 2050. Karl-Heinz Lambertz, president of the CoR pointed out how “EU has set targets and is increasing investment, but still it isn’t enough: we need to do more to enable regions and cities to make the transition, create green jobs, become energy efficient and cut more emissions.” Speakers at the Summit were united on this subject matter, highlighting once again the important role of cities and regions in tackling climate change issues and transition to the clean energy. In response to these challenges, the CoR is currently working on two formal EU opinions to foster the implementation of Sustainable Development Goals in Europe: 1) The socio-economic transformation of coal regions in Europe, 2) Implementation of the Paris Agreement through innovative and sustainable energy transition at regional and local level. However, in order to achieve successful energy transformation, it is crucial that all levels of governance are on the same mission. Local and regional authorities have to be able to manage this change on their level, starting with best practices and active involvement of all citizens. To obtain the highest quality input and wide range of different opinions, the CoR calls for all citizens to contribute to these goals. 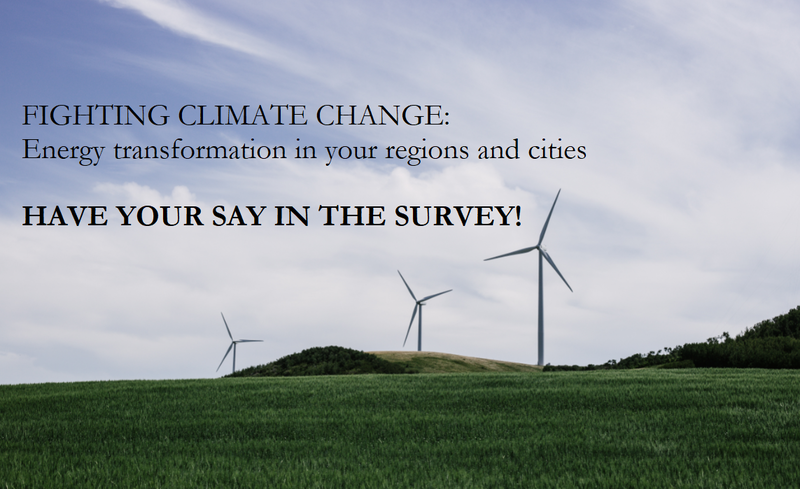 You can do so by participating in an online survey which will be open until midnight on 15 April 2019.